Highgate Area Guide - What makes Highgate so great? Where do Highgate locals go? Tranquil and quiet. I love coming here and having my lunchtime refresh! Everything for the bookworm! Latest thriller or literary classics.. If you like it thin crispy and freshly baked, then Strada has the pizza for you! Tucked away just off Millfield Lane, it is a lovely quiet place to go and relax and walk - and even better when it is sunny! Mmmm...steak and chips..just like in Paris! Amazing range of sandwiches - all freshly made...and if you have a room try one of their cream scones! Blooming brilliant! Massive bouquets of lovingly prepared flowers for that special occasion! Amazing fresh whole foods salads and really helpful friendly staff! Lovely stylish pub with a contemporary feel and a bit of a local institution! Smart brasserie that coves all the classics! As the name says, some excellent labels at great prices and also a place to give clothes a second loving home to! Excellent views of London's skyline, where you can see St Paul's Cathedral, the Shard and the Gherkin. A great place to be when the sun is out! A gastro pub with substantial breakfast, lunch and dinner menus, as well as a large selection of beers and ales. Share your favourite place to go to in Highgate. "It is in Highgate that Samuel Taylor Coleridge retreated to the home of Dr James Gillman, where he overcame his opium addiction and went on to write a number of his most famous works. He was affectionately known as the 'sage of Highgate'." 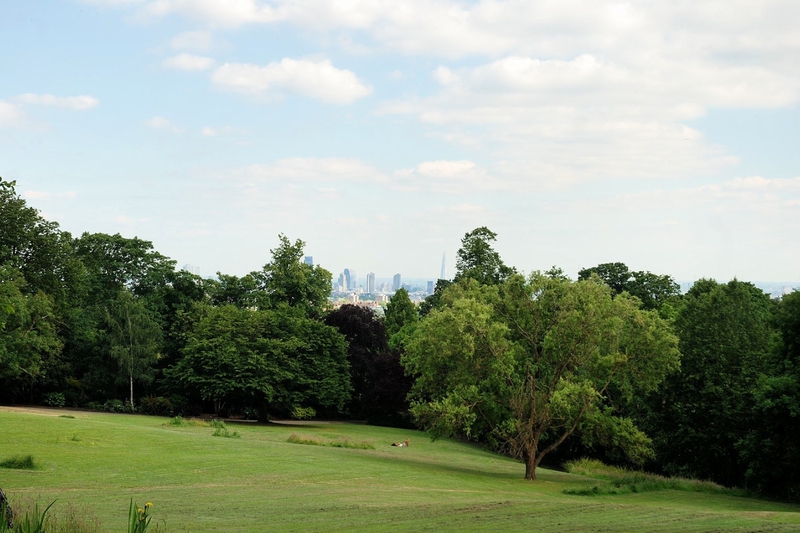 Peeking out from behind the trees in Waterlow Park is an impressive view of London. From the ponds to the beautiful views, there is no better place to spend a sunny day than on Hampstead Heath. Highgate High Street has an amazing selection of upmarket shops, cafes and restaurants - I love being in the centre of them all! Great old buildings. Nice history. Lots of parks. Great views! Fantastic village atmosphere and beautiful period properties. What do you think of Highgate? Highgate is an area of North London on the north-eastern corner of Hampstead Heath. The area is characterised by many green expanses including three ancient woods, a park and a famous cemetery. At its centre is Highgate village, a collection of largely Georgian shops, pubs, restaurants and residential streets, interspersed with diverse landmarks such as Highgate School (1565), the Gatehouse inn dating from 1670 and Berthold Lubetkin's 1930s Highpoint buildings. The village sits atop a hill which provides views across London, climbing 375 feet (114 m) above sea level at its highest point. Highgate is one of the most expensive London suburbs in which to live. It has an active conservation body, the Highgate Society, to protect its character. The area is divided between three London boroughs: Haringey in the north, Camden in the south and west, and Islington in the south and east. The postal district is N6. What are your favourite things about Highgate? Find out how much your flat or house is worth om Highgate. Feedback about living in Highgate has been submitted directly by the public and may not neccessarily reflect the views of Foxtons. The description of Highgate was modified from Wikipedia and is available under the Creative Commons licence. Land Registry data is Crown copyright. All the views and contributions contained within Foxtons Local Life are those of the contributors. All content is assessed before publishing for taste, however free opinion is encouraged. Foxtons accept no payment or sponsorship for content that is posted about Highgate.